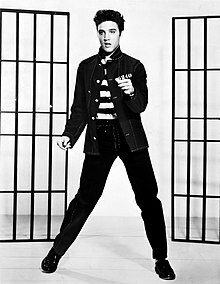 Hi Elvis Aaron Presley (Enero 8, 1935 – Agosto 16, 1977) amo an usa ka Amerikano nga magkaranta, aktor, ngan musikero. usa nga cultural icon, agsob hiya tawagon nga "Elvis" la, danay liwat tawagon hiya nga "An Hadi han Rock 'n' Roll". Bertrand, Michael T. Race, Rock, and Elvis. University of Illinois Press; 2000. ISBN 0-252-02586-5. Billboard. Madonna Leads Busy Billboard 200 With 7th No. 1; May 2008 [cited February 6, 2011]. Gibson, Christine. "Elvis on Ed Sullivan: The Real Story". American Heritage. December 6, 2005 [archived September 24, 2009; cited December 31, 2009]. Goldman, Lea; Ewalt, David M.. Top-Earning Dead Celebrities. Forbes. October 29, 2007 [archived June 11, 2008; cited January 5, 2010]. Guralnick, Ernst; Jorgensen. Elvis Day by Day: The Definitive Record of His Life and Music. Ballantine; 1999. ISBN 0-345-42089-6. Humphries, Patrick. Elvis the #1 Hits: The Secret History of the Classics. Andrews McMeel Publishing; 2003. ISBN 978-0-7407-3803-6. Marsh, Dave. The Heart of Rock & Soul: The 1001 Greatest Singles Ever Made. Da Capo; 1999. ISBN 0-306-80901-X. Moody, Nekesa Mumbi. USA Today/Associated Press. "Mariah Carey Surpasses Elvis in No. 1s"; April 2, 2008 [cited April 14, 2010]. Myrie, Russell. Don't Rhyme for the Sake of Riddlin': The Authorized Story of Public Enemy. Cannongate; 2009. ISBN 1-84767-182-9. Ramsland, Katherine. TruTV. "Cyril Wecht: Forensic Pathologist—Coverup for a King"; 2010 [cited January 4, 2010]. The Immortals: The First Fifty. Rolling Stone. April 15, 2004 [archived 2008-06-25; cited December 29, 2009]. 1969 Rolling Stone Covers. Rolling Stone. 2009 [archived July 5, 2008; cited December 24, 2009]. Lacey, Rose. Top-Earning Dead Celebrities. Forbes. October 24, 2006 [cited June 5, 2011]. Lacey, Rose; Pomerantz, Dorothy; Greenburg, Zack O'Malley; Paine, Jake. In Pictures: The 13 Top-Earning Dead Celebs—No. 2 Elvis Presley. Forbes. October 25, 2010 [cited June 5, 2011]. Scherman, Tony. "Elvis Dies". American Heritage. August 16, 2006 [cited December 29, 2009]. Semon, Roger; Jorgensen, Ernst. Elvis.com. "Is Elvis the Biggest Selling Recording Artist? "; February 12, 2001 [cited February 4, 2011]. Trust, Gary. "Chart Beat". Billboard. June 2, 2010 [cited July 22, 2010]. Ini nga pakli kataposan nga ginliwat dida han 07:35, 14 Enero 2015.